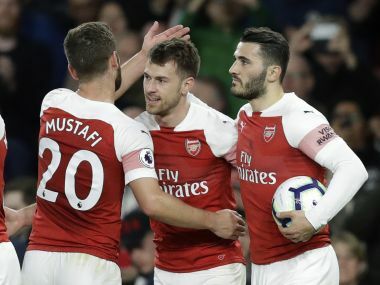 London: Unai Emery challenged revitalised Arsenal to write their own history after they climbed to third place in the Premier League with a 2-0 win against Newcastle on Monday. 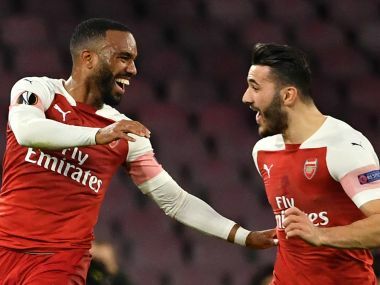 Aaron Ramsey's first-half strike was followed by Alexandre Lacazette's killer second in the closing stages at the Emirates Stadium, maintaining Arsenal's impressive progress under Emery. Emery's side climbed two points above fourth-placed Tottenham and fifth-placed Manchester United to bolster their chance of qualifying for the Champions League via a top-four finish with seven games to go. It is the first time Arsenal have been as high as third place since April 2017, highlighting their improvement since former Paris Saint Germain boss Emery replaced Arsene Wenger at the end of last season. Ramsey's fifth goal of the season was only the Wales midfielder's second since he signed a lucrative pre-contract agreement to join Juventus at the end of the current campaign. 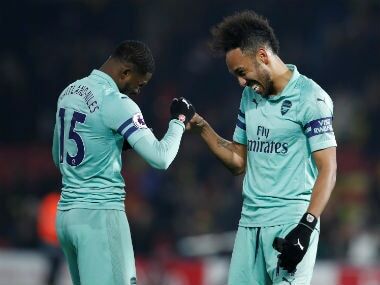 But, while Ramsey won't be part of Emery's long-term plans, the future still looks bright for Arsenal, who recorded a 10th consecutive home league victory for the first time since December 1997 to May 1998. Arsenal finished with 63 points in Wenger's final season, but Emery has matched that tally with seven games to spare. No wonder Arsenal fans celebrated an important win by taunting their spluttering north London rivals with chants of "are you watching Tottenham". "It's a new history. We are creating our own way. Our target is very clear," Emery said. "We have created a big atmosphere here. We are in a good moment, a good mentality with the players. "We are improving and making progress, but we know it is difficult. Tottenham, Chelsea and Manchester United are going to win a lot of games." Newcastle remain seven points above the relegation zone after a 12th defeat in their last 13 meetings with Arsenal. "If you don't take the chances and aren't precise against a good team, you know it is a matter of time until you make a mistake," Newcastle boss Rafael Benitez said, before taking a shot at owner Mike Ashley's lack of investment in new players. "We have been speaking all season about the final third, you have to spend £50 million, £75 million (to have players to make a difference)." Ramsey thought he'd given Arsenal the lead when he swept home at the far post from Sead Kolasinac's flick. But his celebrations were curtailed as the goal was controversially ruled out by referee Anthony Taylor for Sokratis's shirt tug on Florian Lejeune. If Arsenal felt aggrieved by that debatable decision, they poured their frustration into breaking down Newcastle's five-man defence. Emery had surprisingly left Gabon forward Pierre-Emerick Aubameyang on the bench as Mesut Ozil started behind Lacazette. Aubameyang has 22 goals in all competitions this season, but his absence wasn't a problem for Arsenal as they unhinged Newcastle's massed rearguard in the 30th minute. Matteo Guendouzi passed to Ramsey and his clever flick picked out Lacazette in the Newcastle area. Lacazette was surrounded by three defenders and as he twisted to find space, the ball cannoned off DeAndre Yedlin into Ramsey's path and he guided a low shot past Newcastle keeper Martin Dubravka via the far post. 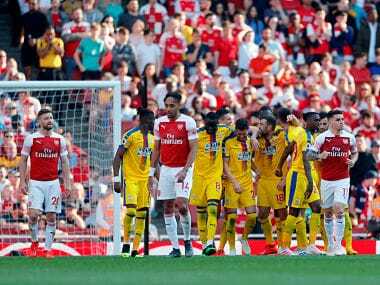 Arsenal remained by far the dominant force and Lacazette almost doubled their lead on the stroke of half-time when his shot was brilliantly headed off the line by Matt Ritchie. Looking for the decisive second goal, Emery sent on Aubameyang with half an hour left. 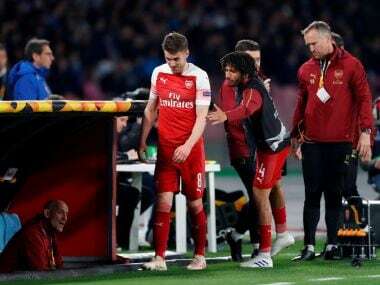 Ramsey departed to a rousing ovation after taking a knock that forced his substitution, then Aubameyang went close when he found space for a low shot that Dubravka turned away. And it was Aubameyang who was the catalyst for Arsenal's second in the 83rd minute. Guendouzi clipped a pass to Lacazette and he redirected it to Aubameyang, who cleverly headed the ball over the statuesque Jamaal Lascelles. With Lascelles too slow to react, Lacazette nipped ahead of the Newcastle captain and chipped over Dubravka for his 15th goal in all competitions this term.